The world around us is an outer manifestation of the inner life of our race, individually and collectively. It acts like a mirror that constantly reflects its state back to us. Subtly and in many different ways, the Universe has always been trying to guide us and teach us by showing us better ways of living harmoniously with each other and our world. Martin Luther, the Father of the Reformation in Germany who, for the first time in its history, made the Bible accessible to lay people by translating it into German, observed: ‘Study the animal world and you will understand human behaviour much better.’ The same applies to all other parts of the world around us. Much new understanding can be found through observing the environment and intuitively interpreting what kind of messages it may contain. For a very long time the Bible has been trying to draw our attention to the fact that, if we but open our inner eyes and ears and pay attention to our environment, God’s human children of the Earth can receive guidance and participate in her great wisdom. Becoming aware of our oneness with all life, we realise that we are indeed in league with the stones of the field and that, when we approach the wild beasts with love in our hearts, they eventually are willing to not to exactly surrender to us, but to tolerate us and live in harmony with us. Through watching them much can be learnt about the loving care and wisdom of the Goddess, the Great Mother of all life and the feminine wisdom aspect of the Divine Trinity. With the help of the animals we can find a better perception of how life works on all its levels. By taking a closer look at the animal kingdom and letting the behaviour of the beasts speak to us it is possible to become more familiar with the drives and motivations of our own inner self. The flying creatures mean to teach us about the human spirit. Like them, we have the ability to fly. Yet, this doesn’t happen effortlessly. It is a learning curve like any other with all its inherent trials and errors. Watch any young bird family. You don’t have to look for anything exotic. A family of house sparrows will serve our purpose perfectly. Observe how difficult it is for the young ones to take to their wings and to go in search of nourishment. But, when they finally take off and soar through the air, they remind us that our spirit can fly, too, and that in truth it is as free as they are, in fact more so! The fishes of the sea are symbols for the creative ideas that are floating in great abundance in the vast ocean of life. When one pays attention to them, they are only too willing to declare themselves to us and help us gain a better understanding of our true nature and high and holy destiny. 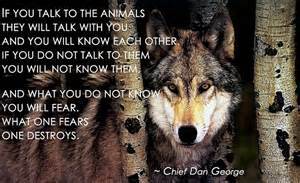 The behaviour of the beasts reveals that what they have within is also in us and many of their habits are also ours. The whole of humankind stands to gain a great deal from paying attention to the beliefs held by the Earth and Nature attuned traditions of people like the Native Americans and Australians. They have always echoed and been in harmony with the ancient teachings the Angels gave to our world down the ages.